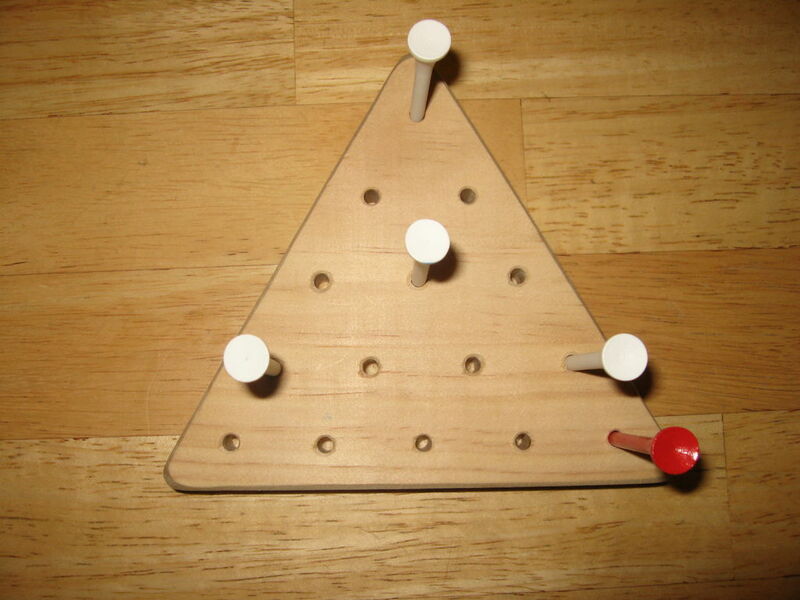 Have you ever been to a Cracker Barrel and tried to solve the peg game while waiting for your food? Well now you can always solve the puzzzle if you remember this method. 1. You must jump each peg over another peg, but only if there is an open space. 2. Each peg you jump over must be removed. 3. You win if only one peg is left at the end of the game. Since it is hard to put into words what you should do, just follow the pictures below. If you have done everything right, you should only have one peg left. Good luck! Leaving one peg is easy. I'm looking for the solution to leaving one peg in all three corners. Anyone know how? brand new peg game. Great, right? All the pegs are in it, so do I just pull a peg and put it aside, so there will be a place to serve as a jumping area, or something else? Thanks! I loved playing this game so much as a kid I decided to make a 75 level mobile game based on it. Check it out at https://itunes.apple.com/us/app/peg-snoids/id10059... and let me know what you think! I only did it with one left once in my life before, but thanks to you, now I can memorize it! Also, see if you can leave 10 pegs instead of one. Yes, I have been to Crackerbarrel, and I did the Peg Game with one left. I start with the middle peg of the bottom edge empty (where you started the blue peg). If I have one odd-colored peg, I put it in the top corner. Then I can announce to the amazed onlookers that not only can I leave just one peg at the end, but it will be the odd colored one, and it will be in the hole that was empty to begin with.